With a speed of 35 A4 pages per minute this innovative system delivers your documents on a convincing quality level. With its technical innovations the system offers high quality, productivity, reliability and security. 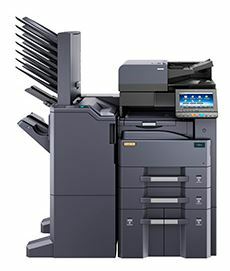 Also, the paper management offers high flexibility due to the possibility of printing onto paper weights up to 256 g/m² and paper sizes up to A3. The numerous options, for example in the area of paper management and finishing, comply with various user requirements. A large colour touch panel, extensive security settings, USB direct print and easy handling complete the overall picture of the new system.